Our local Matamata track will host a mid-week meeting tomorrow where Ballymore will present three runners including last start winner, Lorde Royals (pictured), who will be hoping to make it back to back wins on the same course. Breaking his maiden last month in the hands of leading rider Markk du Plessis, Lorde Royals has trained on well and looks well placed to produce another competitive performance at the home track. “He hasn’t put a foot wrong and the step up to 1400m will really suit him,” co-trainer Chad Ormsby said. 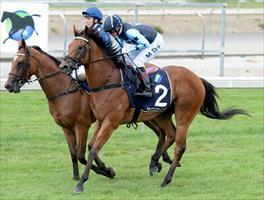 Lorde Royals races in Brendon McCullum’s Vermair Racing silks and will jump from barrier four on Wednesday. Second starter New Born King makes his race return this preparation when he lines up in the maiden 3YO event over 1200m with rider Mark du Plessis has been engaged for riding duties. A handsome son of former Westbury stallion Captain Rio, New Born King trialled well late last month and from the gate will look to be competitive on Wednesday. “He’s shown us good speed at the track and his trial form is good,” Ormsby said. The third and final runner on the card will be Bugle Call who again will be having his second career start, and first this preparation. After not getting many favours on debut last preparation, Mike and Chad elected to turn the son of Tavistock out and bring him back in for an autumn campaign.